A Seminar on DUAL system conducted in Muscat Hotel on 6th Feb. 2019 organized by TSSS, Marian Engineering College and Swissnex India. 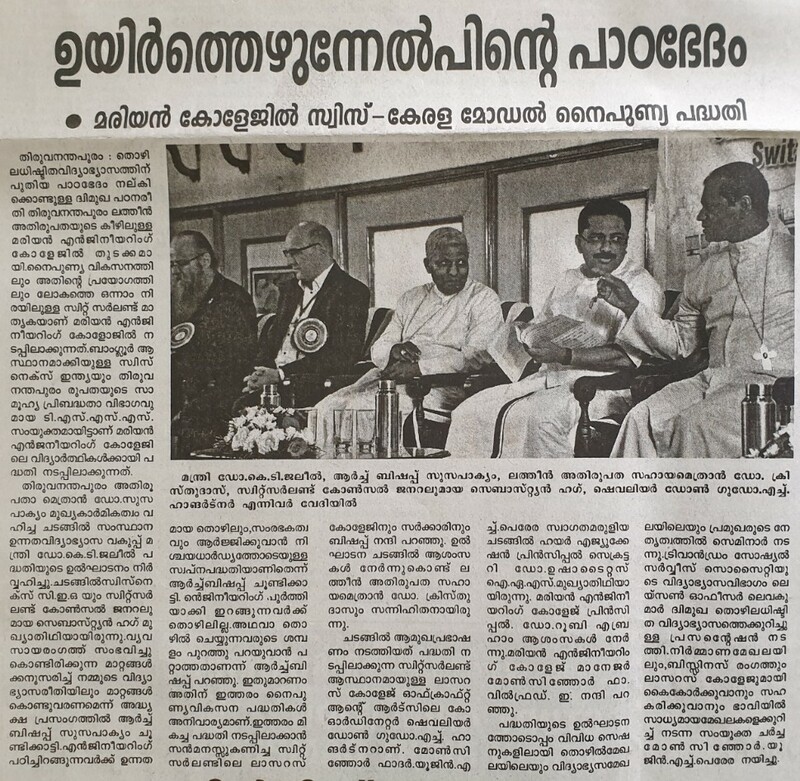 The Seminar was inaugurated by the Honourable Higher Education Minister of Kerala. Shri. 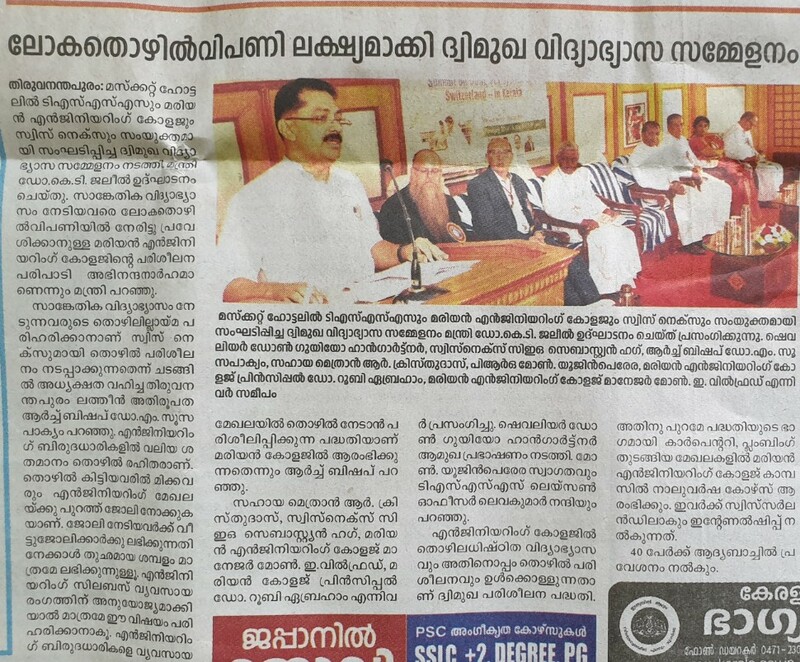 Dr. K. T. Jaleel. While analyzing the DUAL VET system, he highlighted the importance and need of internship programme for the Engineering students. He also appreciated Marian Engineering College which is an institution of Trivandrum Latin Arch Diocese, in planning to institute such a DUAL VET system with the support of Swiss government. The presidential address was delivered by Most. Rev. 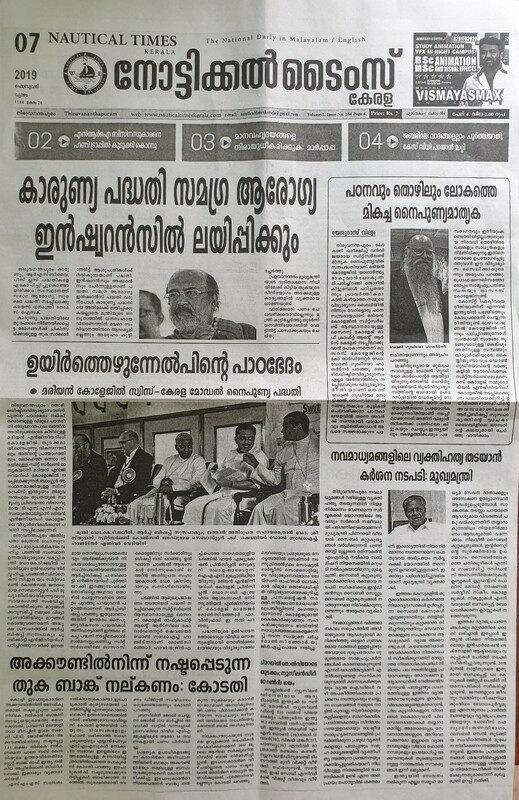 Dr. Soosa Pakiam M., Archbishop of Trivandrum Latin Archdiocese. Many of the Engineering Course completed students from our ongoing Engineering Colleges are not getting sufficient employment and those who are getting employment are related to the field other than the engineering sector- Most Rev. Archbishop has highlighted. And he told our bounden obligation to train the engineering students with full hands on training in the company while undergoing their education. Most Rev. 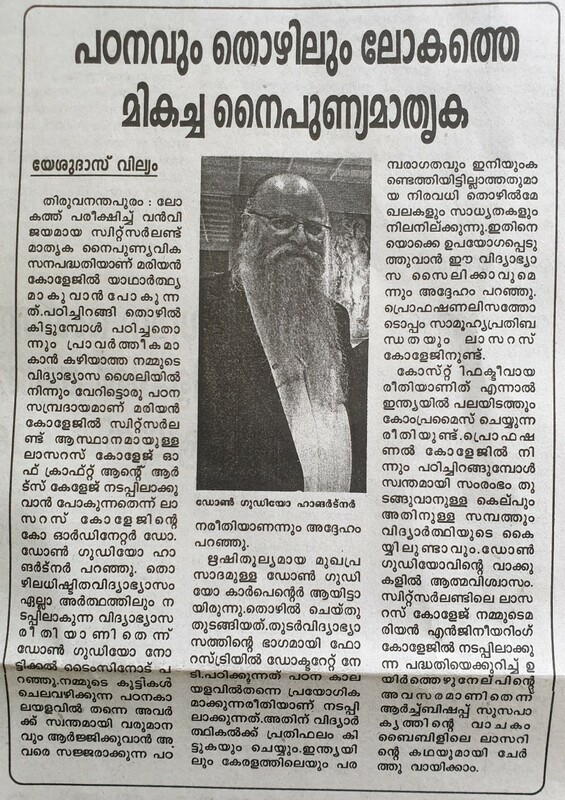 Dr. Christudas R. Auxilary bishop of Trivandrum Latin Archdiocese, Mr. Sebastian Hug. CEO of Swissnex India, Rev. Msgr. John E. Willfred manager of Marian Engineering college, Dr.Ruby Abraham principal of Marian Engineering College, Chev. Don Guido H. Hangrtner, Msgr. Eugine H. Periera Fr. Lenin Raj Director of TSSS has delivered felicitation. A Seminar on DUAL system conducted in Muscat Hotel on 6th Feb. 2019 organized by TSSS, Marian Engineering College and Swissnex India. The Seminar was inaugurated by the Honourable Higher Education Minister of Kerala. Shri. Dr. K. T. Jaleel. While analysing the DUAL VET system, he highlighted the importance and need of internship programme for the Engineering students. He also appreciated Marian Engineering College which is an institution of Trivandrum Latin Arch Diocese, in planning to institute such a DUAL VET system with the support of Swiss government. Most Rev. Dr. Christudas R. Auxilary bishop of Trivandrum Latin Archdiocese, Mr. Sebastian Hug. CEO of Swissnex India, Rev. Msgr. John E. Wilfred manager of Marian Engineering college, Dr. Ruby Abraham principal of Marian Engineering College, Chev. Don Guido H. Hangartner, Msgr. Eugine H. Periera Fr. Lenin Raj Director of TSSS has delivered felicitation. Vocational Education system got a new face in Marian engineering college which is an institutions of Trivandrum Latin Archdiocese. Switzerland has been ranked first in the international rating of professional people. That’s why Marian selected Switzerland as a modal. Swissnex India Bangalore collaborate with social action ministry of the Latin Arch diocese Trivandrum to begin this new educational system for the students of Marian Engineering College. Most. Rev. 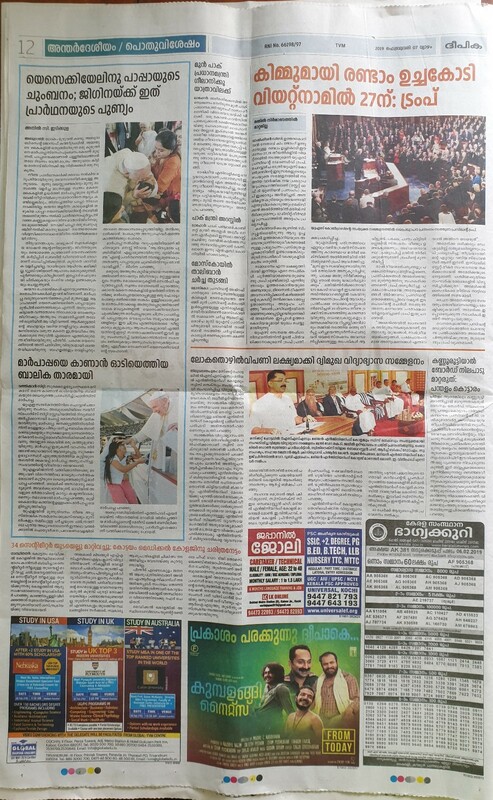 Dr. Soosa Pakiam M., Archbishop of Trivandrum Latin Archdiocese delivered presidential address and Honourable Higher education Minister Shri Dr. K. T. Jaleel inaugurated the DUAL TWIN VET system. Shri Sebastian Hug CEO of Swissnex and consular of Switzerland was the chief guest. Arch Bishop opined that our education system need to change keeping in mind. The changing needs of the industrial sector. This is a dream project aimed to provide jobs as well as self entrepreneurship for graduates completing this duel training most of the engineering graduates do not get placements and if they get employed they work on very meagre salary. This set up has to change and therefore such ventures are inevitable. 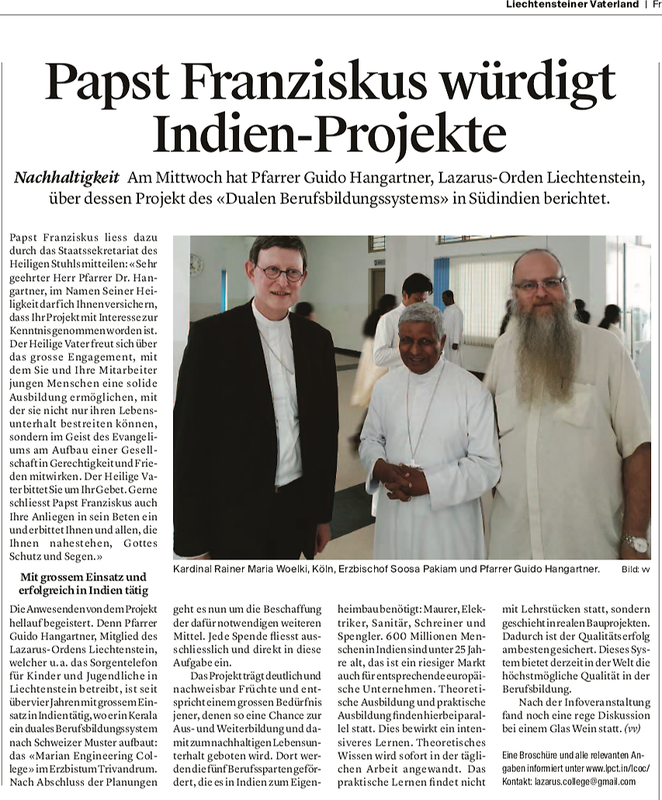 The Arch Bishop thanked the Lazarus college of Switzerland and the government of Kerala for their initiative and supporting this project. Felicitation. After the inauguration of the project seminars and discussions were conducted with the active participation of people from industry, educations and other stake holders. Mr. Levakumar, the lesion officer looking after the educational needs of TSSS gave PPT presentation about DUAL VET system of education. The common interactive session discussed in detail about the possibility of combining the construction field with the education and business under the aggies of the Lazarus College. which was ably moderated by the Fr. Eugine H Pereira, the PRO of Trivandrum Archdioceses. The skill development program which has been very much relevant in the modern world has been introduced in the Marian engineering college by Lazarus College of Craft and Science. The students are unable to carry on the work which they learned in the college; it is the failure in our education system. Lazarus College of Science and Craft, based on Switzerland model, is challenging our education system. The system introduced by Lazarus college in all levels, is based on job oriented – Chev. Guido on Nautical Times. Also our students could earn their livelihood and expense for education by learning in this system. Guido Hangartner started his carrier as a carpenter even though his face look likes a sage. He had done his doctorate in Forestry. He puts into practice whatever is studying for which one can earn the remuneration. There are many job opportunities in India as well as in Kerala. We can make use of these opportunities with the help of this new system. The new college gives us not only a professional approach but also a social commitment. Even though it is coast effective in many areas we compromise. While completing in this new system the students would have a capital in his own hand to start up a new carrier. This is the self confidence that Guido gives us. Introducing this new system is a time of renaissance for Marian Engineering College in collaboration with Lazarus College which has been read together with the parable of Lazarus in the Bible – Arch Bishop Soosa Pakiam said. Nachhaltigkeit. 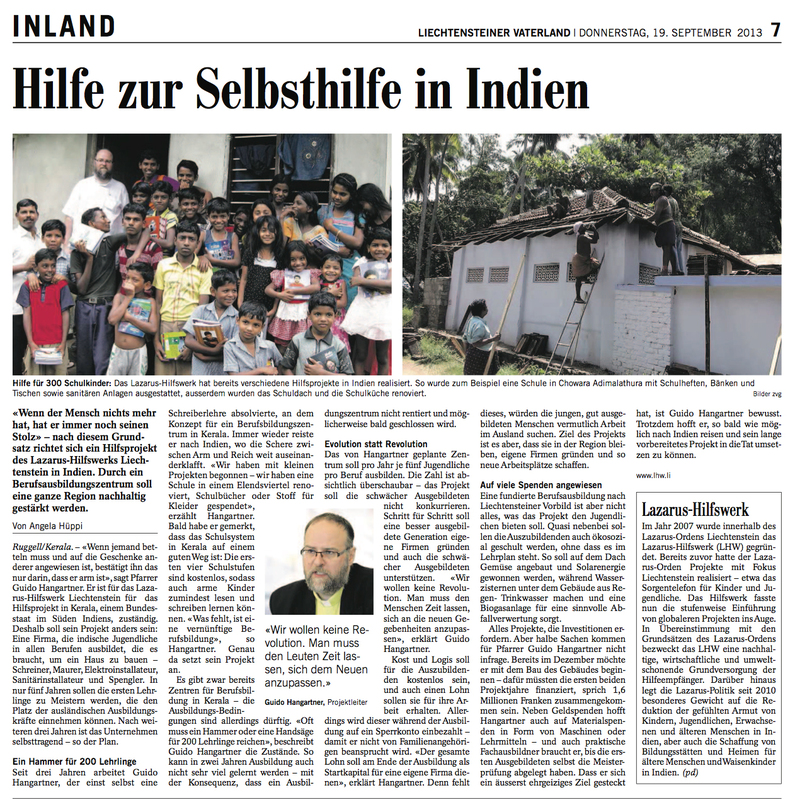 An einer Informationsveranstaltung hat am Mittwoch in Ruggell Pfarrer Guido Hangartner, Lazarus-Orden Liechtenstein, über dessen Projekt der Einführung des «Dualen Berufsbildungssystems» in Kerala, Südindien, berichtet. Die Anwesenden von dem Projekt hellauf begeistert. Denn Pfarrer Guido Hangartner, Mitglied des Lazarus-Ordens Liechtenstein, welcher u. a. das Sorgentelefon für Kinder und Jugendliche in Liechtenstein betreibt, ist seit über vier Jahren mit grossem Einsatz in Indien tätig, wo er in Kerala ein duales Berufsbildungssystem nach Schweizer Muster aufbaut: das «Marian Engineering College» im Erzbistum Trivandrum. Nach Abschluss der Planungen geht es nun um die Beschaffung der dafür notwendigen weiteren Mittel. Jede Spende fliesst ausschliesslich und direkt in diese Aufgabe ein. Das Projekt trägt deutlich und nachweisbar Früchte und entspricht einem grossen Bedürfnis jener, denen so eine Chance zur Aus- und Weiterbildung und damit zum nachhaltigen Lebensunterhalt geboten wird. Dort werden die fünf Berufssparten gefördert, die es in Indien zum Eigenheimbau benötigt: Maurer, Elektriker, Sanitär, Schreiner und Spengler. 600 Millionen Menschen in Indien sind unter 25 Jahre alt, das ist ein riesiger Markt auch für entsprechende europäische Unternehmen. Theoretische Ausbildung und praktische Ausbildung finden hierbei parallel statt. Dies bewirkt ein intensiveres Lernen. Theoretisches Wissen wird sofort in der täglichen Arbeit angewandt. Das praktische Lernen findet nicht mit Lehrstücken statt, sondern geschieht in realen Bauprojekten. Dadurch ist der Qualitätserfolg am besten gesichert. Dieses System bietet derzeit in der Welt die höchstmögliche Qualität in der Berufsbildung. Nach der Informationsveranstaltung fand noch eine rege Diskussion bei einem Glas Wein statt. Rainer Maria Kardinal Woelki, Köln, Erzbischof Soosa Pakiam und Pfarrer Guido Hangartner. Sustainability. At an information event, Rev. 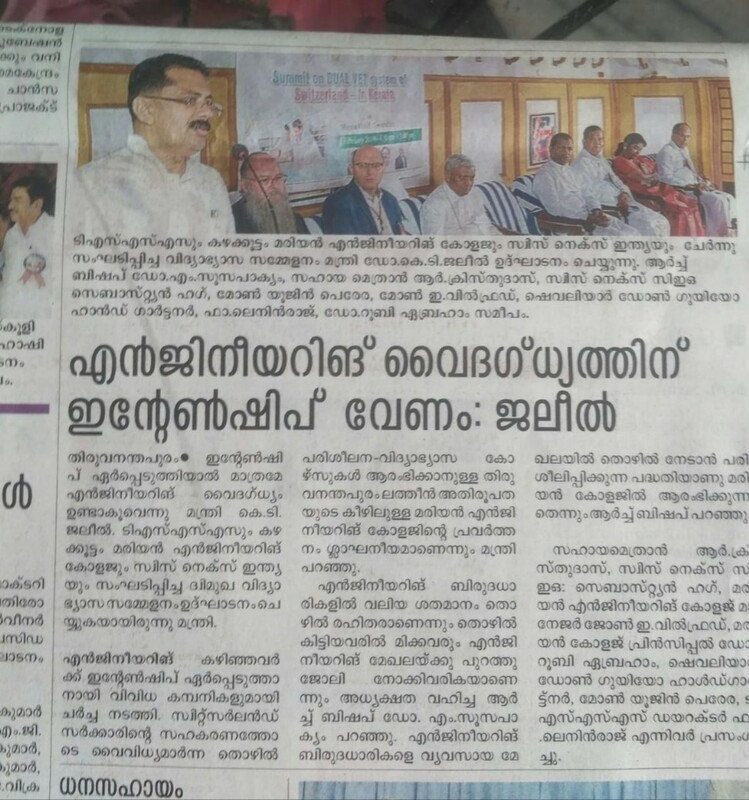 Guido Hangartner, Lazarus Order Liechtenstein, in Ruggell, reported on the launch of the "Dual VET System" in Kerala, South India, on Wednesday. 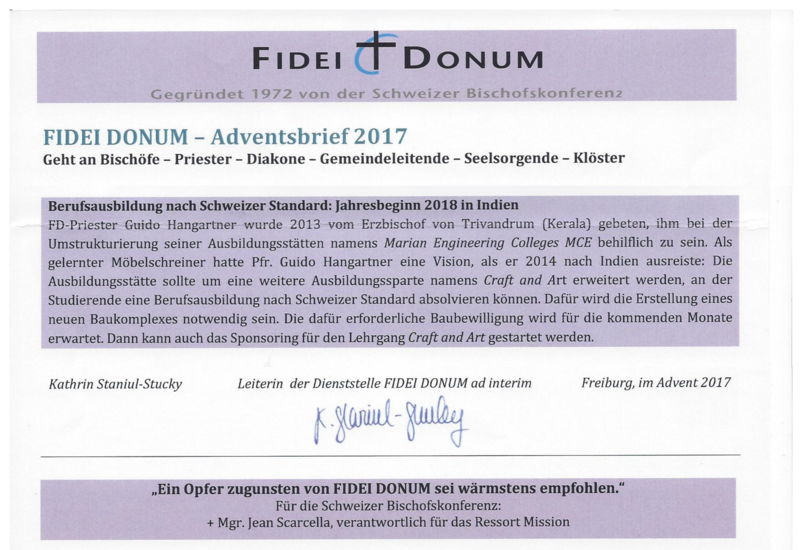 Pope Francis sent a message to the Secretariat of State of the Holy See saying: "Dear Pastor Dr. Hangartner, in the name of His Holiness, may I assure you that your project has been noted with interest. The Holy Father is delighted with the great commitment that you and your associates can give young people to a solid education that will enable them not only to earn a living, but to work in the spirit of the gospel to build a society of justice and peace. The Holy Father asks you for your prayer. Pope Francis also gladly encloses your requests in his prayers and asks you and all who are close to you for God's protection and blessing. " Those present were enthusiastic about the project. For Pastor Guido Hangartner, member of the Lazarus Order Liechtenstein, which u. a. operates the helpline for children and adolescents in Liechtenstein, has been working for over four years with great dedication in India, where he builds a dual vocational training system based on Swiss patterns in Kerala: the "Marian Engineering College" in the Archbishopric of Trivandrum. After completion of the planning, it is now about the procurement of the necessary additional funds. Every donation flows exclusively and directly into this task. The project is clearly and demonstrably bearing fruit and meets the great need of those who are offered such a chance for education and training and thus for a sustainable livelihood. There, the five professions are promoted, which it needs in India for home ownership: masons, electricians, plumbing, carpenters and plumbers. 600 million people in India are under the age of 25, which is a huge market for European companies too. Theoretical education and practical training take place in parallel. This causes a more intensive learning. Theoretical knowledge is applied immediately in the daily work. Practical learning does not take place with educational pieces, but happens in real construction projects. As a result, the quality success is best secured. This system currently provides the highest quality in VET in the world. After the information event, there was still a lively discussion over a glass of wine. Rainer Maria Cardinal Woelki, Cologne, Archbishop Soosa Pakiam and Pastor Guido Hangartner.